We are back after our winter break and heading into our 36th year in the nursery business! In full propagation mode we now have cuttings, seedlings and divisions coming along for spring. We are working on a new system for taking and posting our monthly inventory to our website and hope to have that up and running soon. You can use our last inventory as a guide, but we encourage you to call and double check on current stock. Or better yet, stop by and see for yourself! Native Grasses are in good supply now. Once widespread, they could be found from the coast to the mountains. Deep rooted and long lived, native perennial grasses offer many environmental services. The extensive root systems are excellent for stabilizing soil and increasing soil microbes and mycorrhizae. The large root systems help increase water infiltration, recycle nutrients and filter polluted runoff. They are easy to grow, low maintenance, low water using, deer resistant and beautiful. 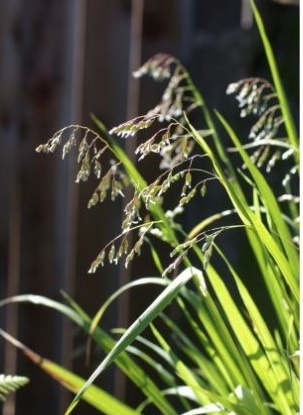 Offering a wide range of colors and textures, useful in mass or as specimens, in naturalistic and formal designs, grasses offer many possibilities for the garden. Here is a sampling of the native grasses available now, most in four inch pots $5.00 and some in one gallon containers $8.50. 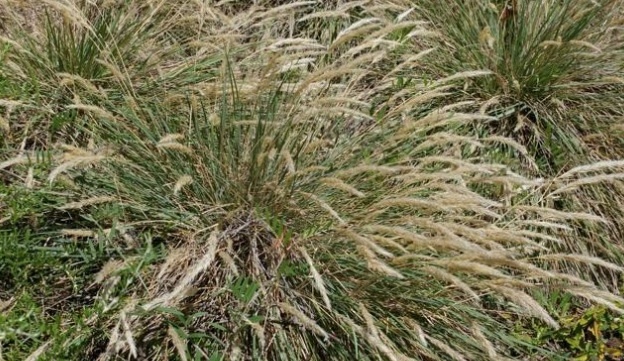 We have two needlegrass species to consider, both are cool season grasses, growing during the moist winter, flowering in the spring and going dormant with summer drought. Both form dense clumps of blades with tall flower stems carrying airy panicles of long, nodding awns that shimmer when back lit. We have purple needlegrass and nodding needlegrass, both durable and drought tolerant for full sun and dry conditions. 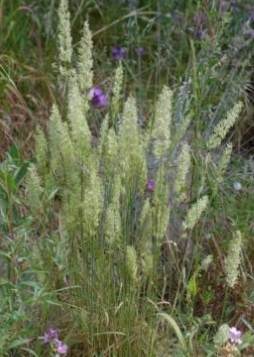 Needlegrass can self sow and will often compete with weedy species. There are two melics to consider. California melic, another cool season grower, native to open meadows and hillsides dotted with oaks and conifers. For full sun to light shade where it thrives in dry conditions or with occasional summer water. The attractive flower spikes are made up of appealing papery bracts and have a sparkling quality. Harford's melic is a workhorse in lightly shady areas, adding verticality and delicate flower spikes. It is a strong reseeder and excellent for erosion control on lightly shaded sites. Small scale bunch grasses include the coastal hairgrass, junegrass and Cape Mendocino reedgrass. Very useful for their size, and the texture and color they bring to the landscape, they are good candidates for a meadow or mass planting. Forming larger bunches is California fescue, an extremely useful grass perfect for planting in lightly shades areas and are a natural under deciduous oaks. 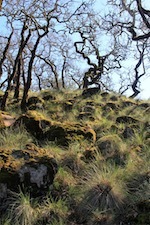 For deeper shade conditions we have vanilla grass, a denizen of redwood groves and forested canyons. Deep-green, wide blades have a sweet scent. An early blooming grass, beginning in late winter, with dainty panicles of white spikelets. To jazz up your plantings consider adding annual and perennial wildflowers and bulbs. The seasonal floral display will add beauty and increase habitat value for bees, butterflies and birds. For your consideration we have Ithuriel's spear, an easy to grow bulb that blooms in late spring or early summer with umbels of beautiful upward facing, funnel-shaped blossoms of blue-purple. We have two cultivars available in four inch pots, 'Queen Fabiola' with medium blue-purple flowers and 'Corrina' sporting darker blue-purple flowers. Both cultivars naturalize easily and rapidly, tolerating both drought and moderate irrigation. Another easy to grow bulb is the single leaf onion, forming colonies of flat bluish-green blades topped with an abundance of starry pink-lavender flowers. Multiplies quickly and thrives in heavy clay soils. Yampah is a charming perennial offering delicate umbels of white flowers in summer. Pollinators are attracted to the densely clustered flower heads. It is also a host plant for the anise swallowtail butterfly. We have full and vigorous 5 inch liners available for $5.00 each. Tarweed, a native annual, blooms in late spring and early summer. Growing 3 ft. - 4 ft. tall, the aromatic foliage supports a multitude of yellow daisies that are bee favorites. Birds adore the seeds that follow. This annual is available in both four inch pots at $3.00 and 2-1/4 inch pots for $1.50 each. Besides the nice supply of grasses, you will find other perennials, ferns, shrubs and vines ready for planting now. As each week goes forward availability will improve. We will be open Saturdays beginning February 4th. Take advantage of the excellent planting conditions and get plants in the ground before spring. Business hours for the month of February are Monday - Saturday 10 - 4.